Dianne Kaye’s suspense novel, Misled, offers a twisting plot that focuses on an unhealthy relationship between two therapists. The story’s beginning is quick-paced and exciting. Jade Anne, who has changed her name from Nadine Hawke, is holed up in a remote cabin near Seattle when she receives a letter from an old lover, Stephan Peltzini, promising to help her find her family fortune in Germany. Nadine and Stephan met five years before when they were both counselors at a treatment center for emotionally disturbed youth. Their relationship ended when a patient hanged himself and his father began stalking them. Stephan, who readers—but not Nadine—learn is a CIA operative, left the country, and a heartbroken Nadine changed her name and started a new life in Seattle. 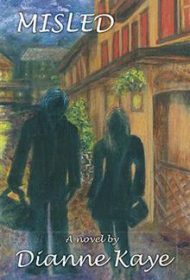 Jade is leery of Stephan’s letter but eager to see him again, so she accompanies him to Germany. They rekindle their relationship and collect Jade’s fortune, but Jade is horrified when Stephan kills a man in front of her. She flees to Seattle but is arrested as a co-conspirator in the murder. The rest of the novel focuses on Jade’s trial and her relationship with a therapist who tries to cure her of her unhealthy “soul tie” to Stephan. Here, readers encounter plot twists that strain credibility. For instance, would the director of the treatment center where Nadine and Stephan worked admit in court that it’s a front for U.S. intelligence? Would a general reveal in court that the murder was a hit ordered by U.S. military? Would Jade’s therapist accuse Satan of creating her problems and recommend that she read Bible passages? Jade’s efforts to free herself from a bad relationship will resonate with some readers. And the book is competently written, with occasional poetic phrases, such as, “Silence fell over the room like snowflakes on ice.” But the plot holes distract from an engaging story that might otherwise appeal to fans of thrillers and courtroom dramas.